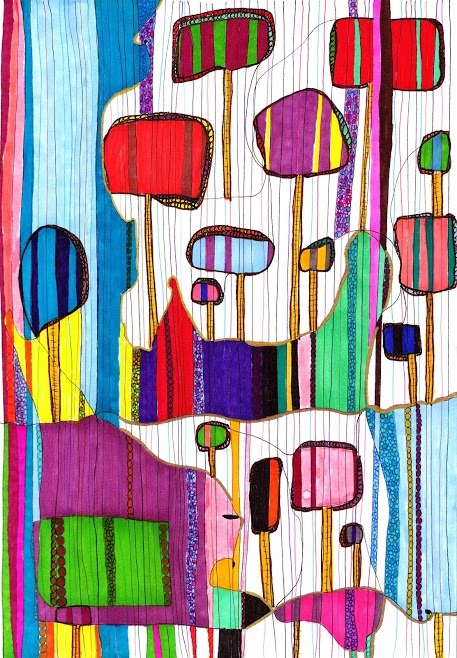 “Rules and Signs” by Laura Didyk, Sharpie on paper, 2015.
wait to understand the village silence with our own. Signs warn, Do Not Enter. Buildings seem in ruins. the chief—materializes, beckons, unlocks the gate. taken down three times by lightning and fire. Why? we ask. Because it was Spanish? He answers, Yes. of the Pueblo Uprising. Only the Hopi remained free. Now women offer us crisp cornets of blue corn piki. like a tiny wing, whirrs the call for thunder and rain. trusting fields to snowmelt, cloudburst, or water cans. So leaves leap fresh that bear no witness to drought. Kathleen S. Burgess, poet, editor, retired music teacher, union officer, statistical typist, server, factory solderer, videographer, and hitchhiker through North, Central, and South America, has poetry in North American Review, The Examined Life, Evening Street Review, Malpaís Review, Turtle Island Quarterly, Mudfish, other journals and anthologies. A chapbook Shaping What Was Left and the anthology she edited Reeds and Rushes—Pitch, Buzz, and Hum are Pudding House publications. Two new collections Hitchhiking to Peru and The Wonder Cupboard are forthcoming. Read an interview with Kathleen here.